Owning a dog is all about sweating the small stuff. It's important to track the small changes in your pet's behavior, otherwise things can go from bad to worse pretty much overnight. Is your pup able to digest the new food you just bought for her? The only way to know is if you track her eating habits. 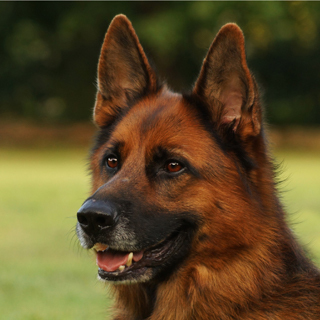 Does your senior dog citizen require a weekly scrub down to prevent shedding throughout the house? That's an easy one - he probably does. Bust most importantly: is your dog happily able to come and go as he pleases? 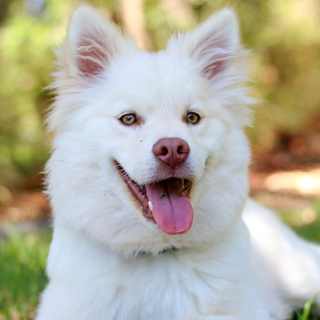 It could very well be that your pup is feeling unhappy about a lack of freedom in your home. The fact is that dogs are usually at the mercy of their owner's lifestyle, and sometimes life gets in the way and you're too busy to take him out for a walk. Of course, it's pretty easy to notice the signs of a dog who feels cloistered indoors: lots of barking, lots of scratching at the base of the door, and of course excess energy exerted around the house. If you feel like your dog would benefit from more license to roam, then it's high time you invested in a sliding dog door. Sliding doors equipped with a little dog door are the perfect addition to your home. 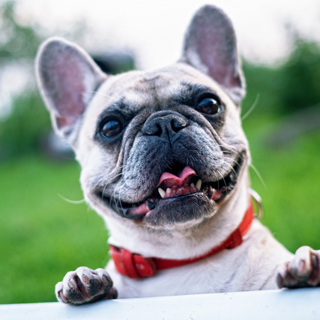 Usually installed in a sliding door that leads to the backyard, a little dog door will make all the difference to the happiness of your pet and your family. Consider that a sliding door for dogs means you will no longer be at the mercy of your pet, and they will never be at the mercy of your lifestyle. You will no longer deal with barking and scratching as your family tries to have a quiet dinner. Nor will you have concerns as to what your little pup might be destroying, at any given moment, with all the pent-up energy from being inside all day. You can sleep soundly knowing that if your dog wants to get a run around at 2am they can do so in the comfort and safety of your backyard without you even knowing about it. Installing a dog door in your sliding door is going to make your life as a dog owner that much easier, and the life of your dog that much better. See Our Doors!Get My Free Quote! Dog doors in a sliding door are designed for easy installation and use. They are panels that fit on the sliding track of your existing glass door. When you move your sliding door from side to side, the dog door moves with it. Usually placed at the bottom left or right of the door itself, dog doors make a seamless addition to the functionality of any type of sliding door. Order One Today!Get My Free Quote! These dog doors are some of the best on the market. 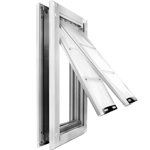 They can be easily installed into any door material, and come with a lock and steel security plate for maximum security. 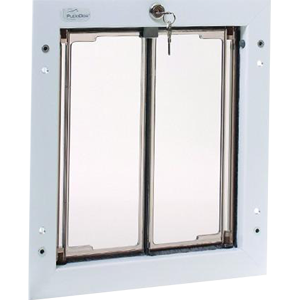 With a 10 year warranty and a 90 day money back guarantee, Plexidor dog doors are a high quality and assured to please. 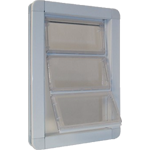 If you're looking for something cheaper than Plexidor dog door but still good quality, Endura Flap pet doors are a perfect option. With dual paneled flaps, a magnetic seal, and a secure locking cover, these doors are weather resistant and secure for your peace of mind. Along with a 15 year warranty and 90 day money back guarantee make Endura Flap pet doors a great option. Ideal Pet Products pet doors are a low end option for those looking to save some money but still get a good product. With a durable flap and a security plate to keep your pet in and unwanted visitors out, these pet doors are a decent quality for the low price. We couldn't be happier with our door! Very professional, excellent install! Our door was an odd size as it was installed in a 1930's home! Utah Pet Access did an excellent job and I'd use again in a heartbeat! Great quality and service! If you are wanting a doggy door, look no further! Well worth the money! We have 4 dogs and needed a professional looking dog door in our house. They removed a glass window with blinds. It looks really good and they had it installed in a week. These guys are GREAT! Utah Pet AccessGet Your Quote Today! Our Utah pet door experts will give you a free and instant quote for any product to install your pet door in Utah with the click of a button. Copyright � 2017 / All rights reserved.